In mid 2011, Catherine Pfeifer, ILRI/IWMI researcher in the Nile Basin Development Challenge (NBDC), posed us a challenge: What kind of exercise could we do that would combine ‘expert’ knowledge of land and water practices with the needs of ‘landscapes’ and communities where these could be applied. The result should be some validated ‘best bet’ interventions that the NBDC and its partners and communities could promote to support more resilient livelihoods in the Ethiopian highlands. Importantly, she wanted to generate ‘strategies’ combining different practices interventions for a whole ‘landscape’ (watershed) – so the combinations of practices, and any trade-offs would be important. The outcome of this discussion was an idea borrowed from the ‘happy families’ card game (where the happiest family is the one with all the members) – a ‘happy strategies’ game in which players need to combine a set of practices into the most compatible strategy for a specific landscape. Following these initial conversations, game cards and rules were developed for testing at a project stakeholder meeting in October 2011. We also decided to test the game with an international audience at the November 2011 International Forum on Water and Food. 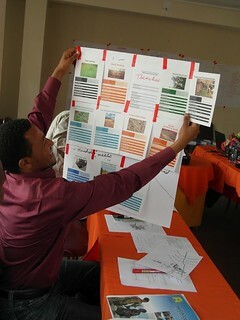 Following these positive experiences, the game was further adapted and translated in July 2012 for use with rural communities. The main objective if the game is to provide a tool for researchers and practitioners to start a dialogue on the complex issues of rainwater management. It uses cards that describe a broad range of rainwater management practices. These are traded allowing a team to form a strategy (bundle of practices) that fits a particular landscape. Optionally, teams can add ‘interventions’ (extension for example) necessary to deliver their strategy. The game has different elements that can be combined in different ways, depending on the type of participants and the specific objective of the exercise. So far the game has been played with experts where the objective is to validate and improve the rainwater management practices knowledge base. It has proved to be particularly useful in stimulating discussion and debate among multi-disciplinary game players. It can also be played with communities and stakeholder platforms to start a dialogue about rainwater management in a particular landscape; it could be played with modelers or students to learn about decision-making problems on the ground. The Nile Basin Development Challenge is supported by the CGIAR Challenge Program on Water and Food. Tags: CPWF, Happy strategies game, IWMI, NBDC. Bookmark the permalink.